This slender book is another worthy addition to the shelf of Holocaust memoirs. Lewis, a Czech Jewish dancer and choreographer, was living a pleasant life of the arts with her husband, Paul, when the Nazis annexed Czechoslovakia and introduced Germany's anti-Jewish laws. 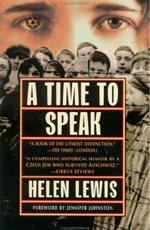 Lewis describes the rapid descent from middle-class comfort as she and her family and friends found themselves barred from most public accomodations, forced to wear the hated yellow star, placed under curfew, stripped of jobs and belongings (even pets), and finally transported to the ghetto of Terezin, a way station to the death camps. From her arrival at Terezin and later at Auschwitz to the end of the war, Lewis struggled with health problems that threatened to speed her to the gas chambers. Her talent as a dancer saved her life, attracting the eye of a brutal female camp commander. Much of what is here is not new, but Lewis's flat, dispassionate prose gives the book's grimmest moments an unholy power. This book is a useful reminder of what can happen if hatred runs unchecked in seemingly civilized societies.